These two chapters conclude the story of Gideon. The tribes are bickering in chapter 8. 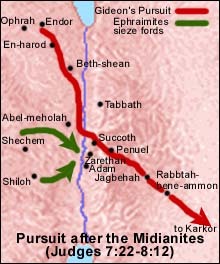 First the Ephraimites complain they weren’t consulted sooner, and then the men of two towns refuse to feed Gideon’s army until the last Midianite kings are captured. Gideon catches the kings, all right. Then he takes vengeance on the men who dared argue with him (guess the punishment)? Next he tells the captured kings that he wouldn’t have to kill them if they hadn’t killed his brothers first. Anyone believe this? Has there ever been a captured king yet in the bible who wasn’t executed?? Gideon even tries to get his young son to do his dirty work, but the kid is afraid, so Gideon has to kill the kings himself. Then he returns home, makes a fancy ephod with plundered jewelry from the battle, takes many wives, has at least 70 sons, and lives to a ripe old age. Abimelech, Gideon’s son by his concubine (or slave), seizes power and becomes king by murdering all his brothers. Most of the chapter relates power struggles and what sounds like a lot like dirty politicking. The feuds get ugly, resulting in death and destruction – at one point Abimelech levels the city of Shechem and salts the ground around it. In the end he gets his come-uppance (make sure to read how! ), and the chapter concludes that “In this way, God punished Abimelech for the evil he had done against his father by murdering his seventy brothers.” (v 56 NLT). This is a troubling bit of biblical morality – god’s punishment is not for causing the deaths of thousands of innocent people, but for decimating the lineage of Gideon. Judges values clans more than individual lives. 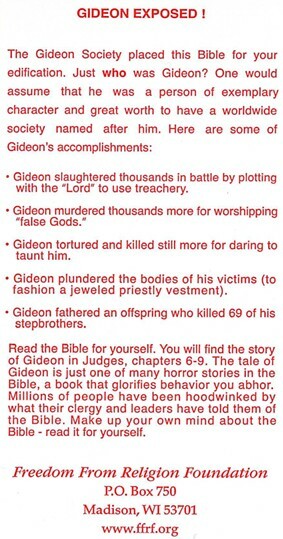 So was Gideon a hero or a monster? You be the ‘judge’. The Freedom From Religion Foundation sells these stickers that non-believers can paste into hotel bibles.